U.S. hemp sales reached record breaking levels last year, thanks to the continued spread of legalization and the growing popularity of CBD oil. Hemp Business Journal recently released their 2017 hemp industry analysis, reporting sales of hemp products hit $820 million. Despite ongoing legal and regulatory complications, the industry grew a total of 16 percent last year. And that number is expected to continue rising. With more and more states seeing the value in hemp, legalization is spreading like wildfire. Hemp Business Journal laid out a market breakdown of where hemp products did their best. Turns out, CBD and personal care products dominated the business. Responsible for 23 percent of U.S. hemp sales, CBD products banked in at $190 million last year. Personal care items come in at 22 percent, generating around $181 million. As mentioned, U.S. hemp sales are expected to rise as laws and regulations around hemp continue to ease. With Congress increasingly supportive of total federal legalization of industrial hemp, hemp experts are predicting sales can more nearly triple within the next 5 years. 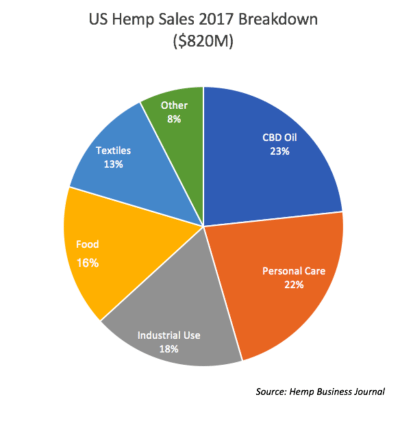 Though it’s only an estimate, Hemp Business Journal expects U.S. hemp sales to reach $1 billion in 2019, and climb as high as $1.9 billion by 2022. This is due to two important factors: Hemp is easier to grow than other resources, such as cotton or corn. With it’s over 25,000 known uses, businesses see large potential in hemp as a resource. Still, we have a long way to go until these estimations become a reality. In 2017, over half of the hemp industry was based in Colorado alone. The biggest barrier: not every state is on board with hemp legalization. Since hemp is still only partially legal, the amount of production allowed varies from state to state. Therefore, we aren’t seeing as big of a hemp boom as we could because farmers and vendors still face regulatory hurdles from growing their crops to bringing products to market. An overhead shot of a growing hemp field. US hemp sales reached record heights in 2017. As of this time, experts expect the hemp industry to grow in much of the southern states (namely, Kentucky, North Carolina, and Tennessee) as well as a great area of the Midwest (particularly, Minnesota and North Dakota). However, with more laws being put into place, such as the 2018 Farm Bill, hemp holds the potential to grow even beyond the estimates mentioned here. Congress could be key to this industry’s success, thanks to a bill proposed on April 12th, 2018. The Hemp Farming Act of 2018 was introduced by Senate Leader Mitch McConnell and supported by Senator Ron Wyden as well as Senator Jeff Merkley. Senators later added the act as an amendment to the 2018 Farm Bill. If Congress passes the Farm Bill as expected, the Department of Agriculture will regulate hemp on the federal level. This would not only make hemp more widely available to farmers but to consumers as well. Almost inevitably, full legalization would increase sales. Still, complications will continue to persist under current plans for nationwide legalization. The current language of the amendment bans anyone with a prior drug felony from growing hemp. The U.S. does not regulate any other crops in this manner. This law could put existing farmers such as Veronica Carpio at risk. Carpio is an early contributor to the hemp industry and the president of Grow Hemp Colorado, but she also holds a past felony cannabis conviction. With this new bill, there’s potential she’ll be kicked out of the industry, in spite of all she’s already done. Future hemp entrepreneurs could also be locked out by their criminal record. However, some hemp industry experts hope the law could be reformed after passage. We can only guess at how high hemp sales could get. Though hemp farming is growing, companies simply don’t have enough of the resource to offer a full range of commercial products. Imagine if hemp was as widely available as cotton. Who knows how many hemp products we’d see on the market? Paul James is a mental health advocate and screenwriter/blogger/journalist. 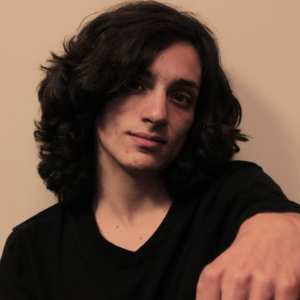 His goal is to change perspectives on a variety of topics for the better sake of society's progression. This would b good to South Africa and Moçambique !